was established to bring to justice Nazi criminals, to oppose crimes against humanity, to help Jewish people where persecuted, to identify important documents and preserve a historic record. 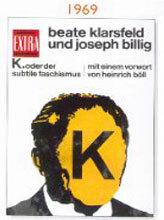 © Copyright 2009 Klarsfeld Foundation/ Sites to Remember, Design. All Rights Reserved.